ABOVE: Noah looking out at Apache Canyon. What’s now highway was once a portion of the Santa Fe Trail. a buffalo-river moving slowly by. I was born beside the Pacific, so I have no first memory of seeing the ocean. I find it fascinating to watch inlanders see it for the first time, processing just how enormous the ocean is in person. 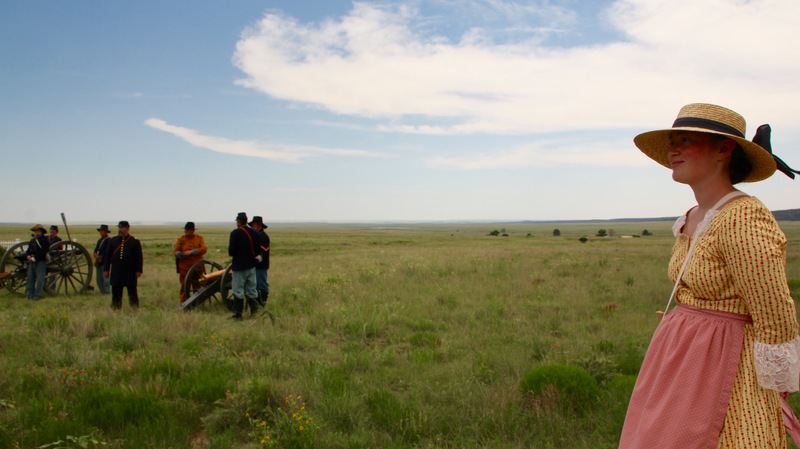 I couldn’t relate to their experience till just a couple weeks ago, when while heading along the Santa Fe Trail towards Fort Union National Monument I was swallowed up by an ocean of prairie. Prairie near Fort Union National Monument. As the mountains recede to mounds along the horizon, you can feel the curve of the earth, as though you are standing on an enormous fisheye lens. I thought such an expanse of ﬂatness would be about as stimulating as a parking lot, but instead some part of my brain that remembers itself to be a savannah ape was switched on. The slope of the land and color of grass stood out in my mind like a living Van Gogh painting. It was one of the most beautiful and alien spaces I have ever encountered. I expect the scent of sage and wildﬂowers will forever bring back a sense of awe and fear. How must this have felt to the men and women who came along this trail before me? Before they even had photographs and westerns to nominally prepare them? And when they returned home, how would it feel to know that not too far back down the trail was that ocean of grass? Historical reenactors at Fort Union National Monument. 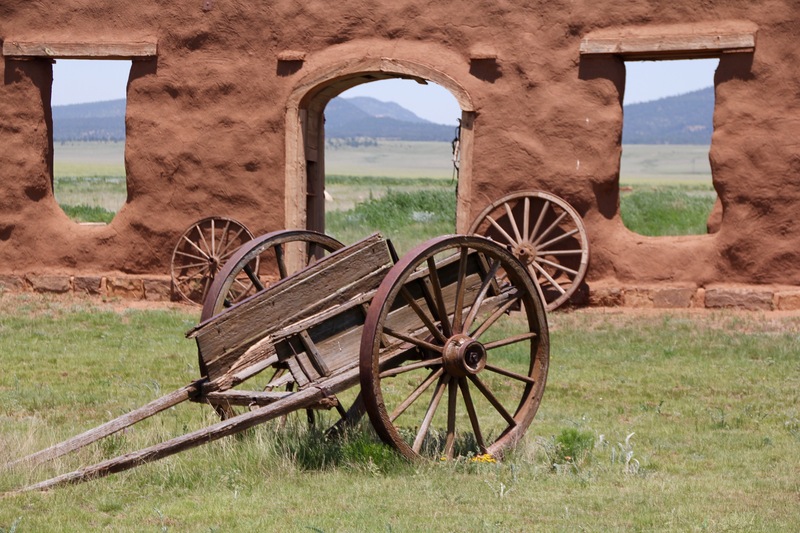 The Santa Fe Trail is amongst the oldest western trails. The trail stretches over twelve hundred miles of prairie, desert, and mountains. Before the trail was created, pueblo and plains tribes had developed trading routes that reached across the continent. The Santa Fe Trail stitched together many of these previously existing routes to connect Santa Fe—then part of Mexico—to Franklin, Missouri, creating one of the most lucrative trading routes of the 19th century. It became a central feature of the Mexican-American War, Civil War, and American Indian Wars, as well as the general American conquest of the West. 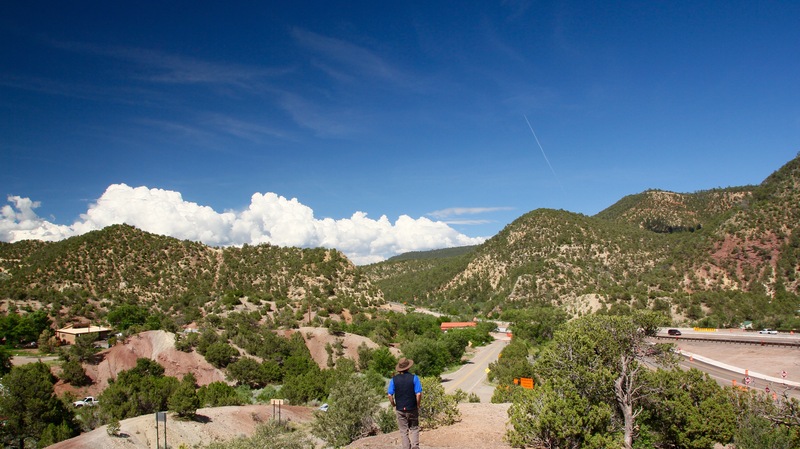 The trail crosses through some of the most diverse terrain, cultures, and history in America. Eventually the railroad ended the economic life of the trail, and with the end of the Indian Wars its military value was over. 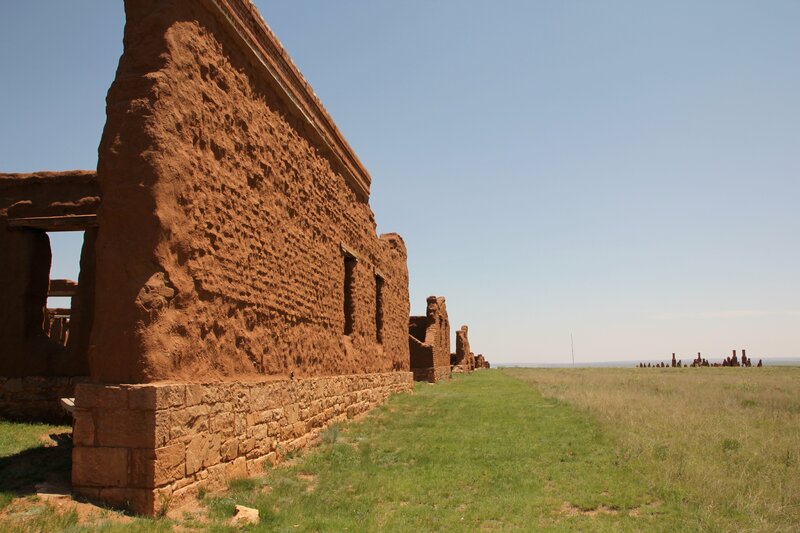 Ruins of Pecos Mission Church at Pecos National Historical Park. Today the Santa Fe Trail is a part of the National Trails System. There is a unique challenge in managing historic trails, as they are both expansive and somewhat ephemeral. 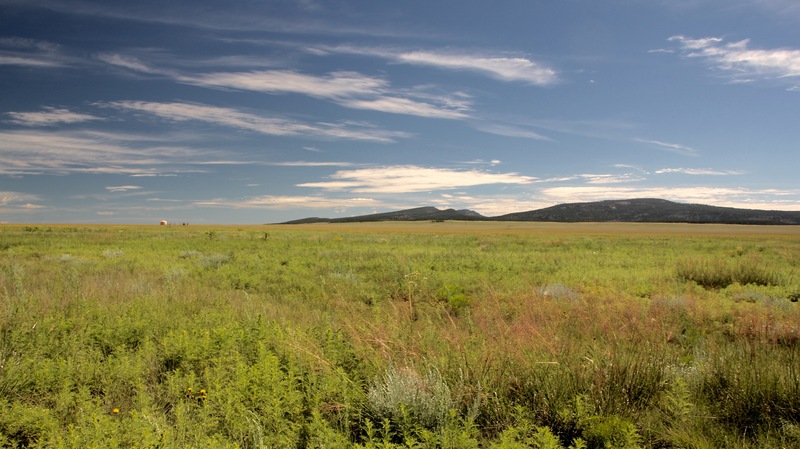 Unlike a park, the Santa Fe Trail passes through a variety of public and private lands. There are many stakeholders who can be very far from each other both in distance and in vision. Also, unlike a physical resource, a trail is more of an idea—like a point on a grid. There are wagon ruts and artifacts seeped into the landscape, but they are easily overlooked by the untrained eye. The trail is a lot like a river, it follows the path of least resistance, but its shores are constantly changing and shifting. All this can make sharing and interpreting the trail for the public quite diﬃcult. 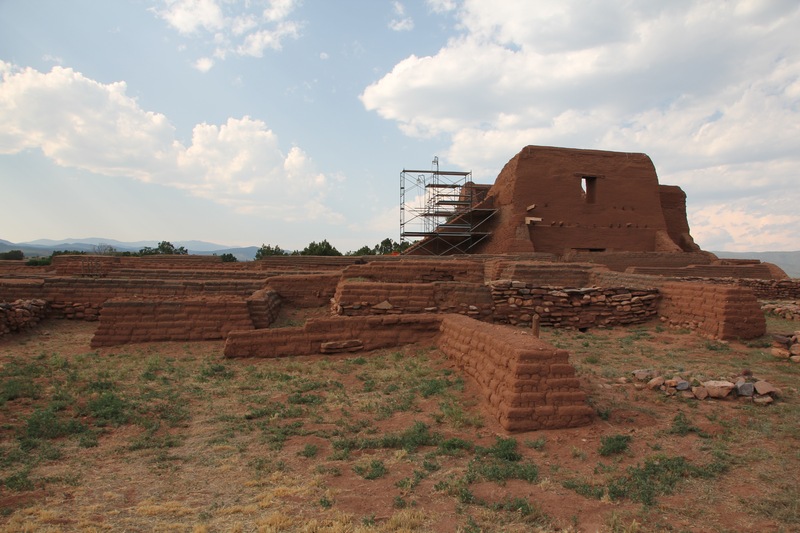 For my SCA Americorps internship with National Trails Intermountain Region, I am assisting in the creation of a mobile media tour of the Santa Fe National Historic Trail. The tour will be a sort of pocket interpreter, allowing you to access information on the history, stories, culture, and ecology of whatever section of trail you happen to be traversing. I am particularly focused on designing, collecting, and producing content for Pecos National Historical Park, Fort Union National Monument, Bent’s Old Fort National Historic Site, and Fort Larned National Historic Site. The tour will not only provide information on particular sites, but create a coherent story of the trail in its entirety. The goal is to produce a product and experience that is more than the sum of its parts, and thus connect people to the whole trail. 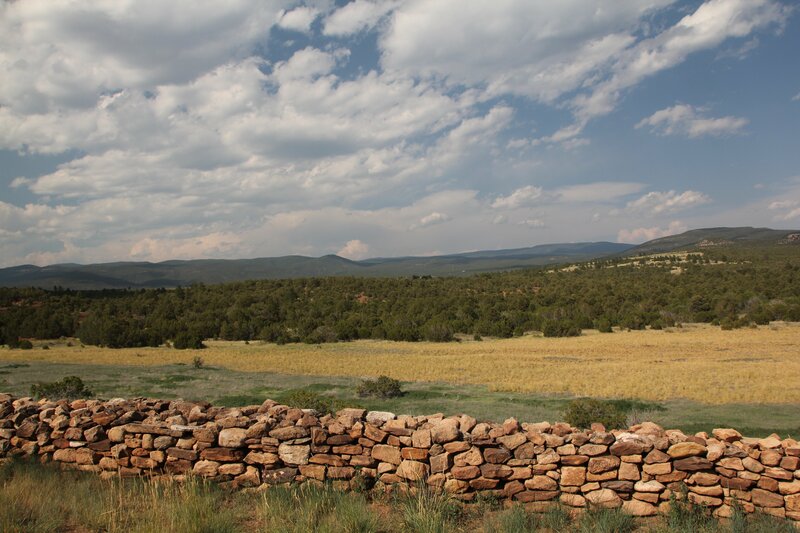 View of landscape from Pecos National Historical Park’s Pueblo wall. When the pueblo was still inhabited the surrounding landscape was treeless. As valuable as individual parks and wildernesses may be, they create a dualism. Inside is protected, outside is free game; inside is sacred, outside profane; inside is nature, outside is humanity. A trail obscures this, it connects much more than one point to another. It ties cultures and environments together across great spaces. It can teach us to see how the places where we live are all connected to each other. It opens us up to see how our individual rivers all combine into one great ocean. It also reminds us that nature and culture are dynamic and changing spaces, and that conservation is less about holding back a tide than finding that path of least resistance. It is like the Taoist ideal of wei-wu-wei, action without action. The most valuable forms of conservation don’t protect in isolation, but connect people to resources in a way that keeps the river ﬂowing. Adobe wall and prairie at Fort Union National Monument. In starting this internship, I have entered an incredible ocean. I am surrounded by incredible lands and people, and I can hardly believe that my job is to share them with others. I have had my moment of awe and wonder, and am now heading out to experience and capture incredible sites. I do hope, however, to keep that first sight of the ocean close to me throughout the journey.